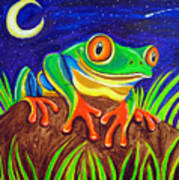 I totally adore frogs ... well, actually, I'm partial to toads, but they're all adorable!!! Will have to start posting some of my amphibian images. 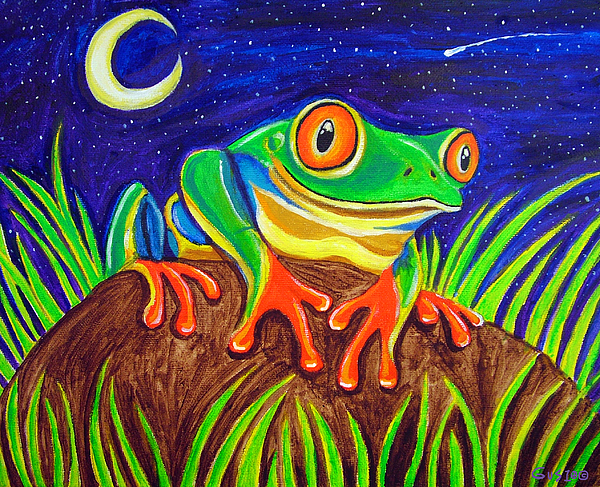 I LOVE your work here ... the bright colors against the deep blue night sky are genius for bringing out the richness!!!! Well done!!!! 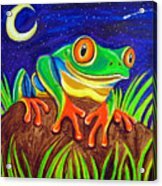 I really like the vibrant colors that you use- especially with the frogs. You have a wonderful portolio Nick. These paintings are amazing! Lovely colors! They would make nice illustrations for children's books! Thanks for your kind comments. What can I say? First, thanks so much for your comments! Second, I LOVE your tree frogs. They're vibrant and bright, colorful with playfulness. Wonderful. An endangered red-eyed tree frog at night with a starry sky and moon behind.